The Monroe mom whom Manhattan prosecutors say ran a high-priced call-girl operation has changed lawyers again, despite a legal victory on Friday by her most recent lawyer. Anna Gristina has been held for months on a felony charge of promoting prostitution. A judge in Manhattan set her bail at $1 million cash or $2 million bond after prosecutors argued that Gristina, who's not a U.S. citizen, has powerful supporters and connections overseas who could help her flee. Gristina's family had retained Chester lawyer Gary Greenwald to represent her. On Friday, Greenwald convinced the Appellate Division to agree to hear an appeal of the high bail on an expedited basis. Arguments for a bail reduction will be held June 7, Greenwald said. 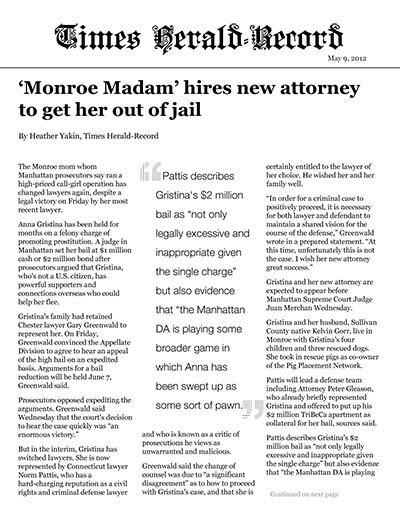 But in the interim, Gristina has switched lawyers. She is now represented by Connecticut lawyer Norm Pattis, who has a hard-charging reputation as a civil rights and criminal defense lawyer and who is known as a critic of prosecutions he views as unwarranted and malicious. Greenwald said the change of counsel was due to “a significant disagreement” as to how to proceed with Gristina's case, and that she is certainly entitled to the lawyer of her choice. He wished her and her family well. Gristina and her new attorney are expected to appear before Manhattan Supreme Court Judge Juan Merchan Wednesday. Gristina and her husband, Sullivan County native Kelvin Gorr, live in Monroe with Gristina's four children and three rescued dogs. She took in rescue pigs as co-owner of the Pig Placement Network. Pattis will lead a defense team including Attorney Peter Gleason, who already briefly represented Gristina and offered to put up his $2 million TriBeCa apartment as collateral for her bail, sources said.